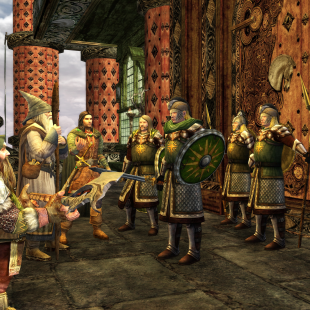 Community manager Rick Heaton has confirmed that Turbine's license for The Lord of the Rings Online has been renewed. The Lord of the Rings Online has been running for nearly 7 years now and while it has undergone some major changes in that time it has remained a consistent destination for Tolkien fans hoping to make their mark on the lands of Middle-Earth. That being the case, the game's license, which allows its developers at Turbine to work within The Lord of the Rings IP, was set to expire in 2014. This, of course, had some players wondering about the game's fate going forward this year. Luckily, its developers have firmly laid any potential concerns to rest and confirmed that the game's license has been renewed. "We have said as far back as July of 2013, we plan to support LOTRO for many years to come," said community manager Rick Heaton. "I really want to be as clear as possible on this subject to avoid any further confusion or misunderstanding. The license was renewed." The new license will last until 2017. Honestly, we would have been very much surprised if the license had been allowed to expire. Having just received a substantial expansion in November it simply wouldn't make sense for Turbine to let the game's license lapse. That being the case, it's still always nice for dedicated fans to have an official confirmation and hopefully this one will ease fears for those gamers who were anxious.